DO YOU NEED A PERMIT TO BURN? A permit is NOT required for small recreational fires used for pleasure, religious, ceremonial, cooking, warmth or similar purposes. If in doubt, call us at (520) 818-1017 for clarification. A permit is required for residential open burn of non-toxic vegetation waste that is generated by the property. Only the owner of the property may apply for a residential open burn permit. A site inspection by a GRFD Fire Inspector is required. The permit MUST be on site during the burn activity. 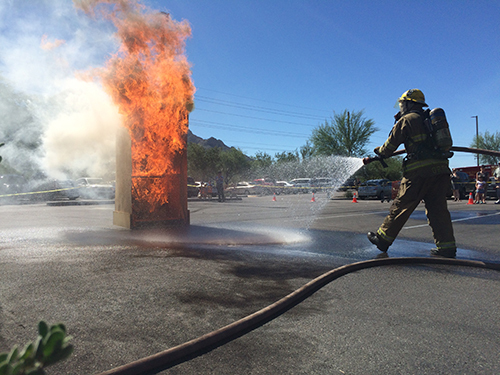 If you burn without a permit, burn prohibited materials or commit reckless burning, the fire will be extinguished and you can be held liable for the cost of the emergency response, extinguishment and cleanup. Violations can also result in a citation and/or arrest. Any garbage from the processing, storage, service, or consumption of food, household waste, chemically treated wood, lead painted wood, linoleum flooring, composite countertops, tires, explosives, ammunition, oleanders, asphalt shingles, tar paper, plastic and rubber products, household chemical bottles, plastic grocery and retail bags, waste petroleum products (crankcase, transmission, transformer oils and oil filters) asbestos, batteries, antifreeze, aerosol spray cans, electrical wire insulation, hazardous waste products (paints pesticides, cleaners, solvents, stains, varnishes and other flammable liquids) plastic pesticide containers or bags and hazardous material containers that contained lead, cadmium, mercury, or arsenic compounds. When an approved permit has not been issued. When burning is banned or on “Red Flag” warning days. When winds are greater than 10 M.P.H. When a person age 18 or over and knowledgeable in the use of fire extinguishing equipment is not present at all times to watch and tend such a fire. When burning creates a nuisance to surrounding properties or is determined to constitute a hazardous condition. Residential burn permits will be good for 180 days from date of issue. Notification for each burn date must be given to the Fire Marshal’s Office prior to burning. Once the application is submitted, a Fire Inspector will contact the applicant to schedule a site inspection within 48 hours. The inspection must be done prior to burning. Fire ignition shall be no earlier than one hour after sunrise, and shall be completely extinguished two hours before sunset. The fire shall not be allowed to smolder, and must be attended to constantly by an adult. A charged garden hose and rake or shovel must be available at the site. Burning generates smoke. When residents see smoke they call 911 to report potential fire in the area. It is Golder Ranch Fire District policy to respond with an Engine to “smoke in the area” reports to provide emergency support for unintentional fires. Even if you have a permit, a Fire Engine may respond to verify Safety concerns. THE FIRE MARSHAL CAN REVOKE ANY PERMIT FOR CAUSE.